I see this topic posted several times, but I'm not sure if there is a solution. 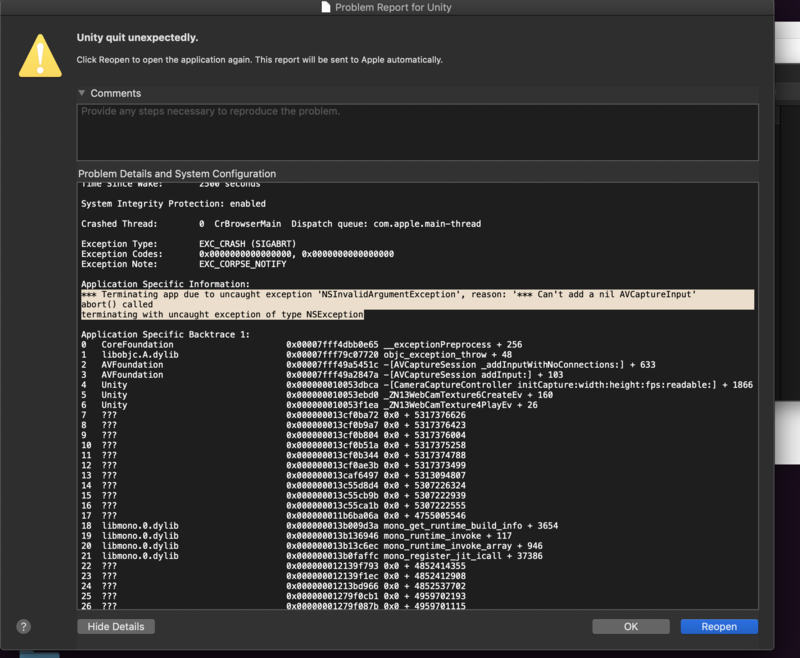 I have tried several computers with the same setup, and I get the exact same crash after the initial Vuforia setup in Unity. Unfortunately, the crash log does not tell us much regarding the source of the issue. If you can provide us with a repro project, in the form of a zipped Unity project folder, so that we can try to reproduce locally this would be the best way forward. Unity doesn't show up on the Security & Privacy settings list, did you have this problem? Thanks very much for the crash log. Very helpful to us. I've escalated to the team for further review. I'll update this thread with any relevant updates. I have the same problem as well. As I set an Arcamera and play it ,unity suddenly crashed. I have tried several computers with the same setup, and I get the exact same crash after the initial Vuforia setup and play in Unity. I've been having the same problem for a while now and I was hoping it would get fixed with an OS update. But no such luck so far. 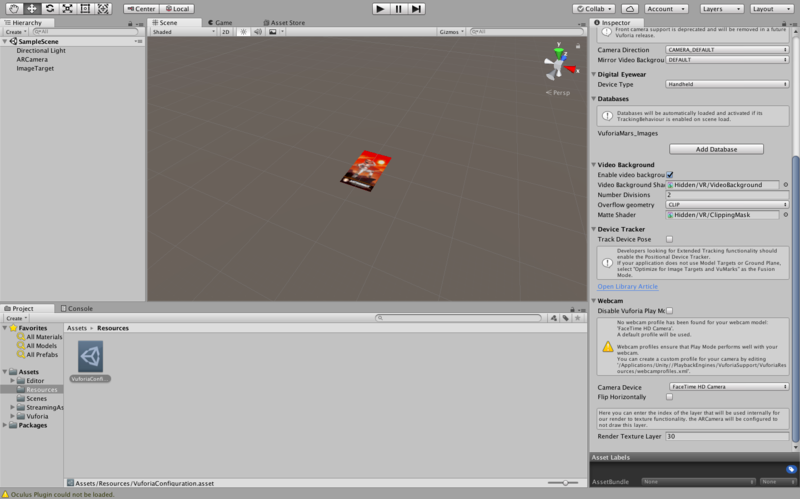 All I have to do is create a scene with a target, a Vuforia ARCamera and hit play to make Unity crash to the desktop. Every time. Any solutions, or suspicions as to what might be the cause ? Unity already has access to my camera. I came across this issue and solved it by going into my Security & Privacy settings and allowing Unity to access my camera. Thanks for the reports and apologies for the inconvenience. I'll work with the team to see if we can determine what's happening. Same here. No matter what I try, can't get Vuforia to work. Old scenes or new ones, as soon as I press play Unity crashes to the desktop. I have the very same issue. Unity 2018.3.5f1, Vuforia 8.0.10. Instant crash when hitting "Play" with a scene that contains 1 Directional Light, 1 AR Camera and 12 ImageTargets. 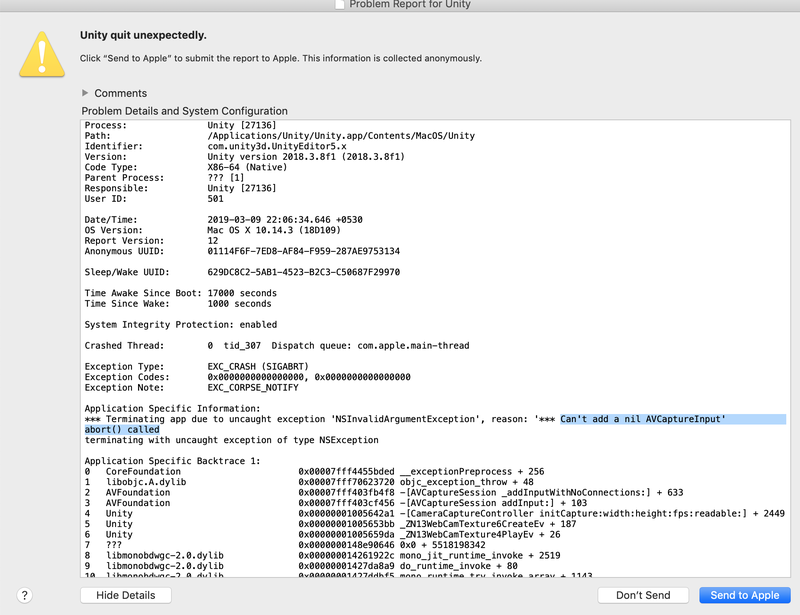 Crash log says "Can't add a nil AVCaptureInput". We are getting same kind of crash . ALL detail are in crash log. I just added ARCamera and hit play button , unity get crash. Hope You guys have some solution for this. I am trying since Five month but no clue. Only thing I feel is after updating to Mojave OS it started. This issue is scheduled to be fixed in our next release (SDK 8.0, mid-Jan). Is what you're seeing similar? Also, can you provide some details about your workstation setup (Mac/PC, OS version, type of camera)? Was this observed while running the Vuforia Core samples, unaltered? In all our testing I don't recall seeing this issue. Nor have I seen it recently on the forums (or maybe I just overlooked it). Do the Vuforia Core Samples exhibit the same behavior?